Heather Saxton with her completed 'Grow Your Own' certificate at Bute Produce. In days of yore the seasons were marked by many customs and local festivals. Passing from summer into autumn and preparing for winter was both a time of celebration and trepidation – would the fruits of community labour be enough to take everyone through the unknown challenges of winter? In Celtic lore Samhain marked the end of the harvesting, and became linked into religious remembrances of the dead and economic quarter days, better known as Halloween, All Souls Day, and Martinmas. Historical accounts of Bute give an insight to how people fared, at a point where the community had a weekly market and three annual fairs. There was export of food to markets in Greenock and Glasgow, and just 0.4 per cent of the population had poor relief and this is noted as helping to meet rent. The annual cattle show on Bute has a very long history, and included exchanges and sales of seeds, roots and dairy produce. The food supply chain is very close and closely associated with the wealth and health of the community. Today, we do not make these associations quite so readily. It is common to talk about unemployment, food poverty and quality of food provisions as separate and distinct topics with seemingly no obvious relationship between them. We read a story about how much food is wasted, how much is sent to landfill every week, and the impact that our long distance supply chains is having on the climate. Those who labour to produce the choices on supermarket shelves might be half a world away. Work on Bute is more likely to be in service roles than production. Reading the Scottish Index of Multiple Deprivation (2016) it details that 17 per cent of the population live within areas which are the most deprived in Scotland, three of these in Rothesay. The lack of recognition of where our food comes from and how it is produced is not unique to Bute; it is a feature of modern life. Yet, it does not have to be that way and there are actions everyone can take to develop a more sustainable approach. You can make a positive change, and get family and friends involved in sharing food whilst having fun. Have a go at foraging! A forest walk breathing in woody aromas or strolling along one of our many beaches is a great way to reconnect with our environment. It is also a free way to score some healthy seasonal food. Picking berries along hedgerows or scrumping for apples and pears, it is the ultimate food on the go. Along the shore you may find a lovely variety of shellfish such as whelks, mussels and clams – steamed and served with a home-baked loaf, a heavenly feast! You may fancy a different sort of adventure, why not break that big shop habit and have a wander around the wonderful independent fishmongers, butchers and grocers of Rothesay. Ask what’s in season, locally sourced, or bargain of the day and try a new dish for supper. 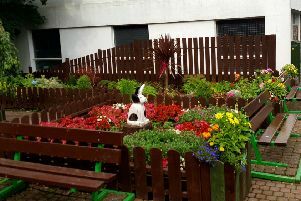 You can also learn to grow your own food at Bute Produce – check out www.fynefutures.org.uk for our range of workshops.